Muslim extremists were training children to commit school shootings in New Mexico desert!! FOX NEWS – The father of a missing 3-year-old who was arrested at a New Mexico compound linked to “extremist Muslims” last week was training children to commit school shootings, court documents filed on Wednesday revealed. Prosecutors allege Siraj Ibn Wahhaj, 39, was conducting weapons training on the compound, where 11 children were found hungry and living in squalor. They asked Wahhaj be held without bail. 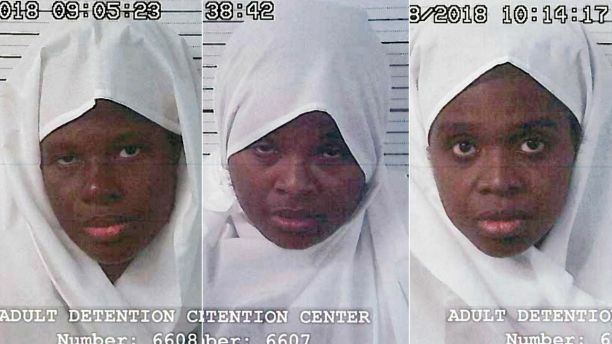 Lucas Morton, Jany Leveille, 35, Hujrah Wahhaj, 38, and Subhannah Wahhaj, 35, [PICTURED ABOVE] were also arrested on the property on Friday and all face child abuse charges. The only food investigators found was some potatoes and a box of rice inside a dirty trailer, the sheriff said, adding the living conditions were “the ugliest looking, filthiest” he’s ever seen. Wahhaj’s family background was already controversial prior to his arrest. Wahhaj is the son of a Brooklyn imam, also named Siraj Wahhaj, who was named by prosecutors as an unindicted co-conspirator in the 1993 World Trade Center bombing, the New York Post reported. The elder Wahhaj, who heads Masjid At-Taqwa mosque, was a character witness in the trial for Sheik Omar Abdel Rahman, the notorious “blind sheikh” who was convicted in 1995 of plotting terror attacks in the U.S. It makes one wonder just how many other terrorist cells we have training children in the US? If it weren’t for this missing child, authorities would still not know about this place.